Pale brownish-yellow to orangish-brown, alitrunk often slightly paler than head and gaster, mandibles usually darker than head, antennae slightly darker, legs concolorous; body with extremely minute microsculpture, surface smooth and glossy. The very sparse gastral pubescence and head the same color as alitrunk will distinguish this species. This large, uniformly pale-colored species is moderately common in Ohio. 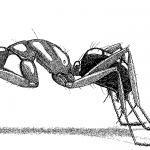 The name refers to chestnut, the predominant color of this ant. Variously described as a “handsome” or “beautiful species.” Named by the French entomologist Pierre Andre Latreille (1762-1833) in 1802. I have critically compared all castes of these two species and I agree that they should be considered distinct species, but they are clearly very closely related and should, in no way, be placed in different subgenera. I have, therefore, moved castaneus back into Camponotus s. str. with americanus. Note the similar preferred nesting sites in soil as opposed to the usual sites in wood for otherCamponotus, lending further credence to the close relationship. Found in woods. Wesson & Wesson ( 1940) note "open, dry, upland oak woods. On very rocky, barren or washed soil it is commoner than C. americanus." DuBois & LaBerge ( 1988) cite open fields for Illinois and black oak dunes by Gregg (1944). Workers found foraging on ground and tree trunks in open woods. Wheeler (1910) states "the workers are very timid and probably nocturnal." Under rock (GAC 1918). "Galleries are often found under stones." (Wesson & Wesson, 1940). "Nests in rotting logs and stumps, exposed soil, or in soil under objects. Occasionally enters buildings usually in search of food."